Safe, Effective, Convenient, Comfortable, Affordable, Professional & Modern Coherent LightSheer Diode Laser- just right for a woman's sensitive skin. For years, the traditonal solutions for removing unwanted hair ranged from tweezing and waxing, to shaving, chemical depilatories and electrolysis-all of which were either painful, messy, slow or inconclusive. Today, laser hair removal presents a safe, comfortable, and effective alternatives with many distinct advantages. Laser hair removal is a revoluntionary treatment modality that uses a beam of highly concentrated light to target the hair follicle and destroy it while it is in its growth phase. 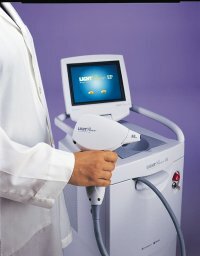 Generally speaking, the laser`s unique light band ‘zones in’ on the dark pigment in the hair follicle, while leaving the surrounding skin unharmed. Because of this, the laser is able to treat an area comprised of many hair follicles, as opposed to electrolysis, which treats one follicle at a time. Consequently, the laser can clear a larger surface in a shorter length of time. While there are many hair removal lasers in use today, we have selected the Coherent LightSheer Diode Laser because we feel it is the most comfortable, time-efficient and affordable. The LightSheer features an exclusive patended cooling tip, which not only protects the skin, but also makes it possible to operate without the application of a cooling gel. It all adds to a more effective use of your appointment time, better results and a safe, more comfortable procedure for the patient. Patients eagerly asking us how long it will take to treat a given area effectively and the usual answer is that, on average, it will take 7 to 8 treatment sessions at approximately 6 weeks intervals. Treatment sessions vary in length from 15 minutes to an hour, depending on the size of the area we are treating. Because the laser treatments will only affect those follicles in the active or ‘anagen’growth phase, the treatments must be repeated at regular intervals to be sure all the follicles receive treatment while they are active. Hair follicles will only be in the active phase about 50% of the time, hence the need for follow-up treatments. Patients also need to know that since the laser targets the pigment in the hair follicles, its results are best on the darker hair. Laser hair removal is a relatively comfortable procedure. Patient reactions will vary, but most people sense just a mild discomfort from the laser's pulsed light-not unlike the snap of an elastic band. For sensitive skins and larger areas, topical anesthesia is available. The area treated will appear slightly red following your treatment. You may notice small hive-like bumps or a little swelling, which will disappear in a day or so. Again, patient response varies here too. Underarms, Bikini Line, Legs, Face, Buttocks, Back, Shoulders, Arms, Hands, etc. and Feet, Chest, Neck, Ears, Naval, Nose, Eye Brows, Upper Lips, Chin, etc. LightSheer- the world's most advanced treatment for effective removal of unwanted hair. Depending on your needs, most body areas can be treated with this state-of-the-art technology.